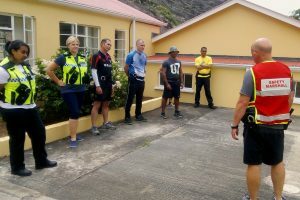 After a much deserved rest, week two of the Initial Police Training began in earnest with a detailed recap of what was covered in week one. 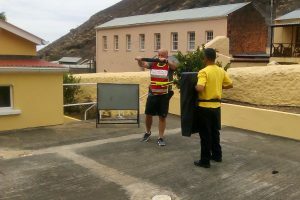 On Monday, the students put into practise what they had learnt – undergoing their first practical scenario of making an arrest. This was done in a safe learning environment with each student being given detailed feedback on their performance, enabling them to improve as the training progresses. The life of a Police Officer isn’t all glamour and the students found out that after making the arrest. There is a lot of paperwork, pocket notebooks, and statements to complete, to name just a few. Tuesday was a long day of theory with students learning about burglary, criminal damage, mens rea and actus reus. 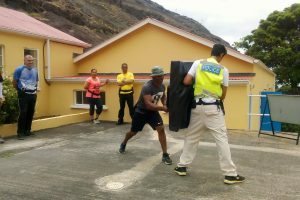 Police Officers have to be able to protect themselves if they are to protect the public, so on Wednesday students began personal safety training. This involved the correct use of the extendable baton and handcuffing. The students were taught how to handcuff suspects and the correct usage of the baton. This was followed by the completion of the appropriate paperwork relating to the use of force and the National Decision Model. An outside speaker from the Health Directorate came in on Thursday to teach the students about triage, which was very well received. Students are beginning to understand the importance of multi-agency working. Lessons were disrupted when all students assisted in the search of a suspected missing person. This was the first time the new recruits had been on the streets in uniform. They aided in locating the person, and it was then time to go back to the classroom. After the eventful morning, it was back to scenarios, this time with a little twist. The students had to complete scenarios within the public domain. This meant having to deal with traffic, members of the public, all while dealing with the incident. They found that this added to the pressure but also made the scenario much more realistic.